There are many keys to any successful business, one of them is the business owner’s ability to drive the business forwards in a way that inspires them to grow it with passion, another is for the business owner to be at the heart of their business confidently. On this workshop Melanie East and Clare Louise invite you to explore all that is possible for you, your business and your creativity and give you the tools to empower your business so it can reach it’s full potential. Set at the home of Graphistudio – Count Ceconi Castle is the perfect space to delve deeper into the magic of your creativity, the heart and soul of your business, refine techniques and craft the next steps of your future. With a wealth of inspiration at your fingertips this soulful location offers you both time and space to discover your version of more. Melanie East is a multi award winning newborn photographer. Her fierce courage, strong business ethics and belief in newborn safety saw her leave a high flying career as a lawyer and craft a successful business doing what she loves – Creating Art in Newborn Photography. 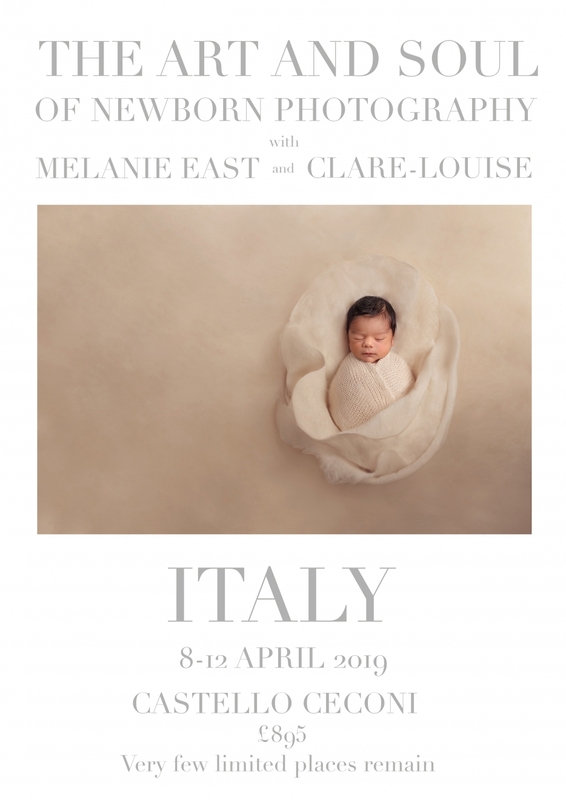 Today Melanie is one of the leading newborn photographers and newborn photography t trainers, a published author on the subject of newborn photography, an international print competition judge who mentors and teaches worldwide.